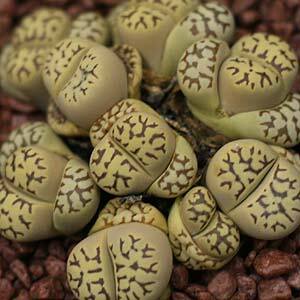 Lithops are commonly called living stones, and they really do look like small stones, are a fascinating plant suited for growing in pots indoors. These are a plant that are increasingly popular and with more varieties available for sale each year, you to could get the Lithop collecting bug. In the natural environmnet they would be easy enough to walk past and hardly notice, however grown in a container they become one of the most fascinating of all of the succulents. The intricate patterns on the tops of these tiny succulents make them some of the most fascinating plants to grow. Species such as L. dorotheae, L.pseudotruncuatella, with its amazing yellow flower, the white flowering L. karasmontana and the ever reliable L.dorothreae (pictured right) are all worth seeking out. Lithops do flower, and despite the complex look, they are surprisingly easy to grow. Although you could grow Lithops from seed, for a beginner we recommend buying some established plants. You can grow them indoors and learn a little about them, before becoming addicted. In general, lithops thrive on low humidity, 5 - 6 hours of sun to good filtered light, protection from hot afternoon sun and, generally dry conditions. A free draining potting mix or growing medium is essential. The main aspects of care involve light, soil and water. If you are growing these plants outdoors, USDA zones 9 - 11 are most suitable. However they do grow well indoors. Lithops grow well in full sun to strong filtered light, this is why they are so good to grow indoors. Most collectors grow them in very shallow containers that allow perfect drainage. At the same time they require good airflow, so allow for this. Lithops require excellent drainage, a specialist succulent potting mix will be adequate in most cases. During summer, almost no water at all, let the soil dry out between watering. In spring when they b egin to break out of dormancy, its time to give them a good soaking, however they still to dry out fairly well between watering's. A simple approach is to only water when the soil has dried out almost completly. The soil should dry out in 2 - 3 days, if it does not, them you need to change the soil mix. Another approach is visual, if the Lithops look firm, do not water much, if at all. If they look like they are shrinking back into the soil, or are wrinkled, they need watering. They are dormant and you should not water them much unless the plant looks like it is dehydrating. Water every two weeks. New growth begins, and this is when the plants flower. The cracks in the Lithop open up and the flower appears.. The new 'stones' that appear after flowering will continue to grow. In our climate you need to keep them warm over winter. Away from cold drafts and cold window sills. Do not remove the old 'stone' even though it looks dead. The new stones are feeding off it. After a few months, mid to late winter, the old stones will have faded away to a thin skin. Now they can be removed. They should come away easily. If not leave them for a few more weeks. During winter you can water once every two weeks, this should be ample. By mid spring its time to increase the amount of water, do this slowly until summer. The trick is to allow the soil to dry between waterings, do not let them shrink or shrivel, and at the same time do not over water. Fertiliser - Not generally required more than once a year. Watering - Dry in winter, every 2 - 3 weeks in summer allowing the soil to dry between watering. Foliage - One pair of modified leaves each year. Flower - White to Yellow, occasionally Orange. Suited to coastal conditions - Generally not suited. The species can be propagated from seed. It is possible to propagate them from cuttings, however this is a very difficult process. They are reluctant to set roots from cuttings. Lithops are available for sale from the following specilaist nurseries.